Found one file extension association related to Terramodel and 1 file format developed specifically for use with Terramodel. Trimble Terramodel software, is a powerful software package for the Surveyor, Civil Engineer and Contractor, who requires a CAD and Design package with integrated support for raw survey data. Terramodel software you can import data collected using the Trimble conventional instrument product line, as well as from the Trimble TSCe Controller running the Trimble Survey Controller software. The software allows you to do all the necessary COGO calculations, quickly and easily produce roadway designs, generate contours, and calculate volumes. With the integrated 3D Visualizer, you can view your project as an interactive 3D model, which makes the design and quality control process extremely efficient. And with the powerful CAD functions available, you are able to perform survey, engineering and CAD tasks all in one package! With the convenience of a number of modules, Terramodel software can be configured to provide the features needed. Additionally road data can be exported from Terramodel software to the RoadLink module of the Trimble Geomatics Office software using the TRMBROAD macro. 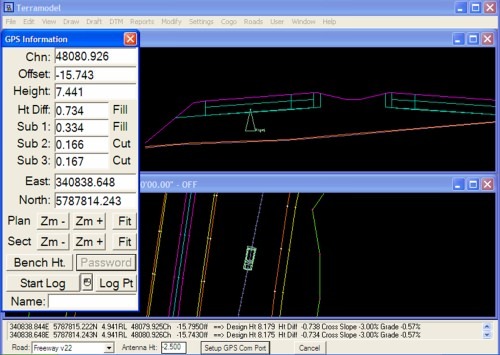 Terramodel macros (TML) for these features are included on the Trimble Geomatics Office. DTM data can be shared using a 3D faces file. Terramodel software is ideal for surveyors who require an integrated Survey, CAD, drafting and surface modeling tool. If you need more information please contact the developers of Terramodel (Trimble Navigation Limited), or check out their product website.